If ever there were a company whose logo should be the image of a smile, it would most definitely be Oh Happy Home (formerly Happy as Larry). The Perth, Australia-based Oh Happy Home may not have a smile logo, but owner and founder Amy Eaton hopes her colorful cotton, felt ball and wool rugs, as well as her playful home products, bring smiles to people’s faces. 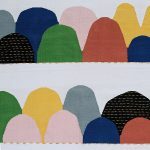 The company’s mission, says Amy, is to “make the world a happier and more colorful place to call home.” For Amy, that desire to bring happiness to families extends to the weavers and their families too. 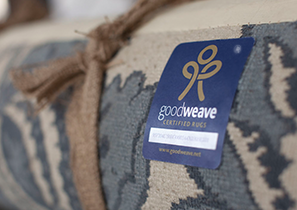 “Joining GoodWeave® helps make sure that happens,” she says with conviction. 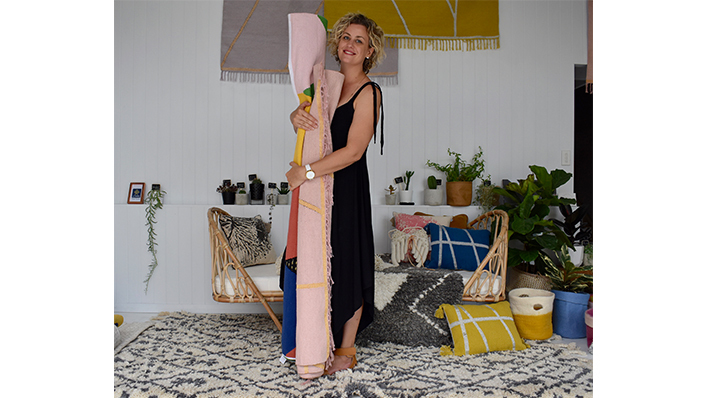 Already well known for children’s rooms and daycare interiors, Amy decided to produce rugs for the entire home that would suit families and be within a reasonable price range. “We’ve even got a washable range that you can throw in the washing machine so it’s great for a family and messy kids and dogs,” says the woman who with three boys, 12, 8 and 3, knows a mess when she sees it. 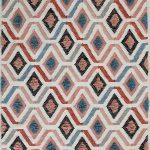 Sometimes Amy says, designs are inspired by her own kids as was the hand-knotted cotton rug, Cotton Hills. “We were on vacation and the kids and I were drawing the view of the hills and that’s where the design ultimately came from.” She also works closely with her producers and suppliers. 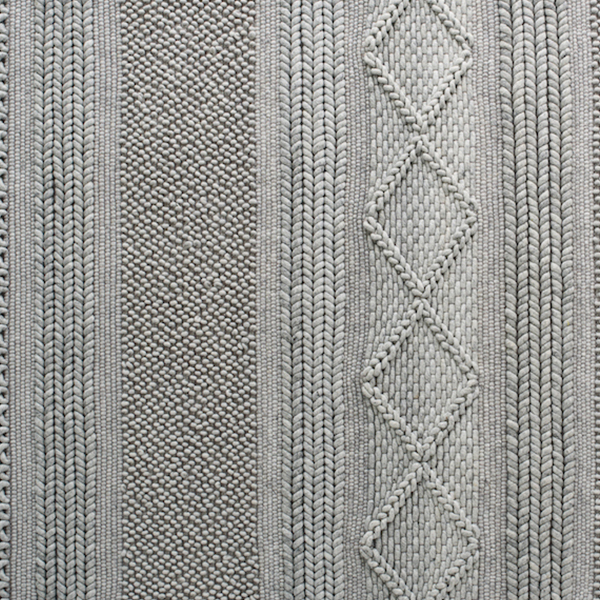 She points to the textured Jasper Knit, a felted wool rug as an example of creative collaboration. 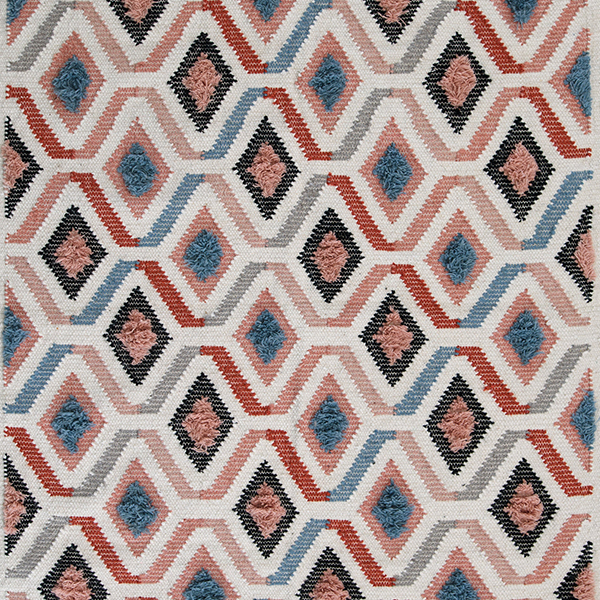 Of late, her absolute favorite rug is the geometric, wool Pink Sahara. “It’s got a bit of Moroccan feel, fun and playful.” But she adds with a chuckle, she doesn’t own one because she only has boys and they just might not go for pink. 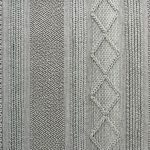 Children are front and center in Amy Eaton’s life and she hopes her alliance with GoodWeave can help her share that value with her customers.